This may not have been South Africa of the ’07 vintage, but they remain a huge and imposing ‘big-three’ side. Even with many players falling into the ‘second string’ bracket they slotted in almost seamlessly in the opening 30 minutes and really took the game to the Springboks. The 12 -3 half time lead was richly deserved, and Ireland looked confident with the game going as planned. However, when Ireland veered off-script we were less impressive. With the ‘Boks down a man the hosts failed to show a ruthless streak to befit those shiny all black jerseys. And that failure before the half time whistle cost. It has become a very worrying trend: Ireland lead at half time, yet give it up. Cast your mind back to Declan Kidney’s golden age, when the minutes between 40 and 60 was the time Ireland pushed the game to a limit and wrestled control of their destiny. Whether you call it lack of a plan B, confidence or just plain game management; it’s happening and it’s not easy to watch. Ireland made their visitors wait on the field for over a minute after half time in the hope they would get cold. They didn’t. The green pack roared into action and mauled the life out of the hosts. Sucking the momentum, along with the crowd noise out of the game. They made their one-man advantage count, we didn’t, and the game was won and lost in those 25 minutes around half time. With the line-out misfiring, there was little incentive for Sexton to direct the ball in behind JP Pietersen or Francois Hougard, but the drift defence had all our running angles covered so it would have been nice to try. Both sides were missing players, but Ireland’s game-plan has previously relied upon the physical prowess of two loose forwards, both absent tonight. Would Rory Best’s line-out darts or a Rob Kearney burst given us an edge? Not the way Ireland’s attack shaped up in the second half. If there was a moment in the second 40 where we threatened, a big ‘Bok hit would land in. Once the ball-carrier was shunted backwards and the defensive line was set we seemed content to put the big men into contact until the move broke down. Eoin Reddan’s introduction provided a brief improvement, but South Africa had our number. At the minute, that number is five and it’s the rising count of consecutive defeats. Email “3 things we learned from Ireland v South Africa”. 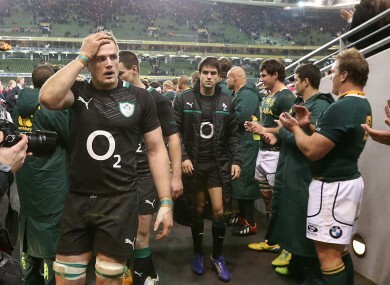 Feedback on “3 things we learned from Ireland v South Africa”.